at Madison St. & Van Buren St.
As you may know, tomorrow, Friday June 17th is the first Forest Park Farmer's Market of the season. This year the market is moving to The Grove and will be every Friday 3:30 to 7:30 rather than every other Friday as it was last year. To celebrate the opening of the farmer's market and to help promote our village's new initiative Live Healthy Forest Park! the Forest Park Community Garden will be at the market giving away native plant gardens to the patrons of the farmer's market. These small gardens consist of 6 sun-loving plants or 6 plants for partial shade, depending on your garden needs. On April 30th Forest Park Community Garden planted over 1000 native plants at the Harlem Ave garden and the plants being given away tomorrow are some of the same ones planted at the community garden. Our goal in sharing these plants is to highlight the native plant gardens now growing at the community garden as well as educating our community about the value of using plants that are native to Illinois in our home landscapes. Once established, these beautiful native plants are maintenance free (no watering! ), have very deep roots which helps control weeds and absorb lots of water which can reduce flooding and they also attract butterflies and songbirds to the garden. They are awesome on many levels! Please stop by the market tomorrow for shopping, native plants and an overall good time. We want to do all we can to make sure the market is a huge success this year! 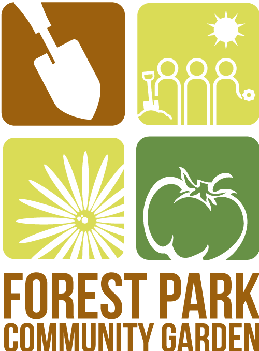 As always, thank you for your ongoing support of Forest Park Community Garden. For more information about native plants please visit Prairie Nursery.